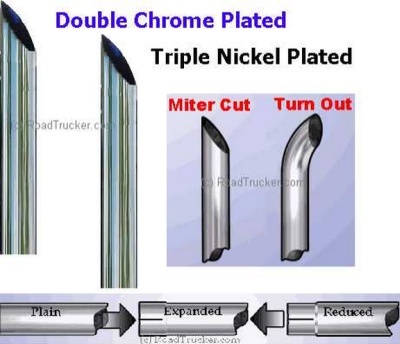 18", 24, 36", 48" and 60"
5" Diameter SuperPremium Chrome Exhaust Stacks for Truckers with Turn Out. Expanded end has a 5" Inside Diameter. Expanded End has a 5" Inside Diameter. Length is 18", 24:, 36",48" and 60". Plain = 5" OD; Expanded = 5" ID. Note: Change the Quantity to 2 to get your 2nd Stack for 1/2 Price. 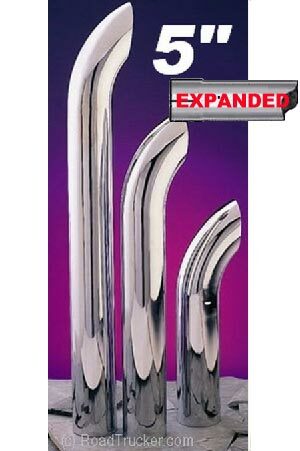 For example, 1 60" Plain Stack is $179.99, the 2nd is 1/2 Price for $90 for a Total Price of $270. The Cart will change to show 2 Stacks for $135 each Total $270).